Using only your mouse and your head, navigate through thirty creative levels in search of a red button. 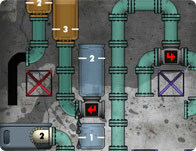 Use your mouse to navigate each level. An interesting physics-based puzzle game in which you must feed the hungry shapes to win! A simple math arithmetic game - try to beat the computer player or a friend to the top of the mountain. Use power ups or save them for later levels, when things get crazy! Help Santa get to his sack using arrows to guide him along the way. Watch out for Jesus, who is out to take Christmas back! Zap your way through more puzzling levels of connection based mazes. Find the path that brings light and unlock more and more challenging stages. Guide this bouncing ball with the power of your bricks! Avoid the shadow ball and build or destroy walls to navigate the maze.